You know, I struggle a little with this blog schedule. On the one hand, I don’t want to post more than three days a week. On the other hand, I don’t want to cram so much into a post that you the one look at all that text and skip on to the next blog (I know – I haven’t quite mastered that one :)). On the other hand, I don’t want to post twice in a day because that’s as bad as adding a day – I know how busy everyone is, how many great blogs there are to read out there, and how limited your time is. On the other hand (I believe we’re up to four hands now… so you see the struggle!) there’s is so much to share!!! I had thought I could solve one problem by posting the monthly interviews on Saturday or Sunday, but I didn’t like that and neither, I think, did you. We all need a break. So I’m booting Oh Susanna this week and putting the interview in here. At the most inopportune times- in the middle of the night, in the shower, when I am driving…The idea for my first children‘s book, What am I? An Animal Guessing Game came to me when I was on a long mountain bike ride twenty-two years ago. When a turtle crosed the trail in front of me, I made up a little rhyming riddle about him. By the time I returned home an hour or so later, I had the book roughed out and some of the verses composed. I never really thought of myself as a writer until that point. I had a portfolio packed with children‘s book art but not one story. And then one day (thank you turtle), I tapped into that part of my brain, and after that ideas kept pouring out. IT: Maybe two things: The waiting- hearing back from editors and art directors, waiting for the book to be printed, waiting for reviews, waiting for royalty statements…The other challenge is having my illustrations in progress (especially covers) reviewed by, not just the art director and editor, but the marketing team, the sales team, the editorial departments etc. I am very easy to work with and totally open to viable suggestions, but after a while it becomes “art by committee.” Have you ever heard the expression that “ a camel is a horse that was designed by a committee?” Well, it‘s something like that! IT: I can‘t put my finger on one thing. There have been so many exciting and gratifying moments. What warms my heart the most is the love and loyalty from my generous fan base – the parents, the early educators, the children, the supportive fellow authors, like you, Susanna. I have met so many wonderful people on this great journey! IT: Timing might have had something to do with it. 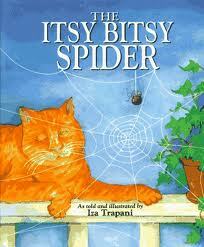 There weren‘t many retellings of nursery rhymes at the time (that I know of ) and so I found a niche in the market. The book became instantly popular with teachers, especially Pre-K to K. I had very positive feedback from early educators telling me how useful the book was in teaching young children to read – that the kids recognized the title so they were eager to look inside the book, that they already knew the first verse so that gave them confidence to learn the other verses. Plus the book could be sung for even easier learning. SLH: Were you surprised by one book’s success over another’s? SLH: Have sales affected publishers’ willingness to do further projects in a good or bad way? IT: The publishing world is in such a sea of change right now and publishers are wary and much more discriminating. It’s a very tough market right now- even for those of us with good track records. 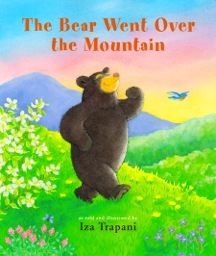 IT: I have a new book coming out Apri11, 2012- The Bear Went Over the Mountain. As for works in progress, I have a few children’s stories brewing and am also working on the last chapter of an adult(maybe YA) memoir. Left-handed or right? I”m a rightie (hands only :-), though I have suspicions I was born leftie and my parents raised me to use my right hand. I lead with my left hand in so many things…Long answer! 1. 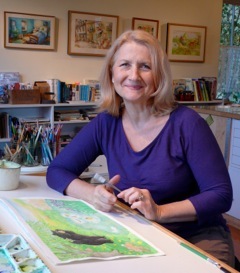 Look for Phyllis’s visit to Saskatchewan on Beth’s blog tomorrow (Tuesday, March 20) – it promises to be quite something! 3. Phyllis had an AMAZING visit to Missouri which you won’t want to miss (especially if you’re a CARS fan :)) so please visit Andi 🙂 And be sure to check in with Phyllis’s World Tour page for updates between blog posts here! Not sure how I missed this post! Wanted to say hello to Iza. We share a publisher, as my pb is also coming out with Sky Pony Press! Looking forward to the arrival of The Bear Went Over the Mountain in April. I am in major waiting mode right now, so I definitely resonated with your response to the “challenges” question. Darn, I was hoping the waiting part would get easier over time, but I guess not. Thanks for the great interview, Susanna and Iza! Thanks, Susanna! The book is Marathon Mouse…while most New York City mice tremble in fear at the thought of being trampled during the City's annual marathon, one brave mouse puts on his running shoes, stretches his stubby little legs, and joins the race to fulfill his larger-than-life dream. It's my first, so very very exciting! I didn't know you grew up in Manhattan! It is funny how many people have connections to marathons. The first editor I subbed to said, “but kids don't run marathons…” I'm fairly certain she had never been to a marathon, because if she had she would have been knee-deep in kids cheering on their parents! Hi Erik! Thanks for checking out my sites. I've done the same with yours 🙂 Nice poem!